I love a good story. And this is a really good one. So get ready. If you are of the “I cant do this” disposition, I’m going to introduce you to someone who completely rips up conventional ideas of what is and isn’t possible with regards to age – with regards to a lot of things actually. Jehane Rucquoi is for me one of the most inspirational people I’ve met this year (and hey I’ve met a few!) At 84 she’s not only building earthbag houses, she’s founded and is constructing an entire natural building community. I’m watching it unfold in awe to be honest. Jehane started out in Belgium, and like everyone who creates something amazing in their life, she’s had her fair share of twists and turns. She’s an artist, and was schooled in the US. At one point she studied colour in LA. It was here she met the famous Iranian architect who invented earthbag building, Nader Khalili. The technique inspired her to such an extent, she stayed at Cal-Earth and studied with Khalili himself for almost two years! It was also at this time she fell in love with the desert. Then, she was struck by an idea, “like a bolt of lightening!” as she puts it, to create a sustainable building project working in harmony with the Earth. Thus the Three Moons Project was born. There have been ups and downs of course. The first plot of land didn’t work out, and the project moved to another location. But Three Moons is now blossoming in the heart of the desert, with domes and bottle walls sprouting up in the dust. Jehane describes the Three Moons Project as a place to work with and adapt to the challenges of nature; the heat, the cold, the wind and of course water shortages. It’s a place of self-discovery too, as any sustainable off-grid building project tends to be. Life within The System of the modern world is comfortable but deadening, and an off-grid mud building project in the wild always wakes people up. The unstoppable Jehane, 84 years young. 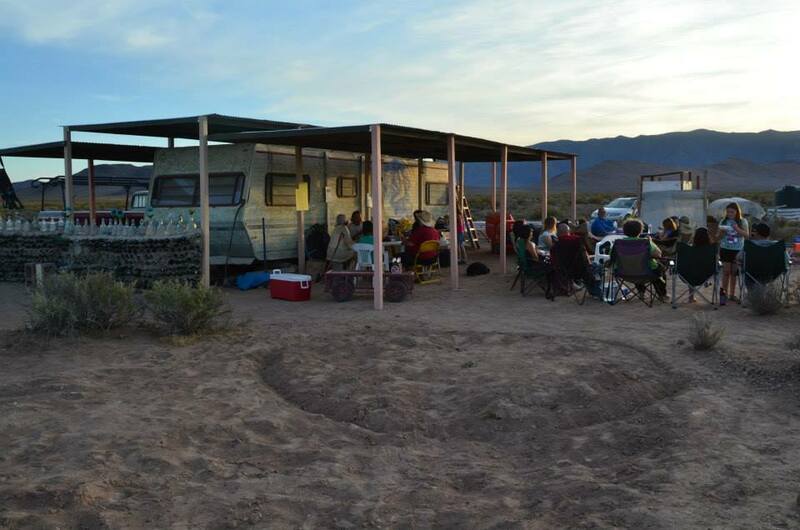 The community is going to suit folk who are comfortable living in simplicity off-grid in the desert, who are open to group creativity, to beauty and to all things Earth-loving. I posted about this before, but seriously this is a VERY good opportunity if you want to learn earthbag building or taste the off-grid way of life. Jehane and the Three Moons Project offer workshops, apprenticeships, workaway opportunities and accept B and B guests. Jehane is very experienced, more than I am. She’s a dome builder, plasterer, and off-grid adventurer, and next year I too hope to be able to visit her project. 3 Moons is a very low impact, off grid world, powered with a small solar system, and using a rocket stove for cooking in the outside kitchen, and heating the shed. Cars, vans and campers are welcome at 3 Moons. Do heed the climate; freezing nights in March and hot days in July! For those who stay and work, there are 2 small beds in the earthbag shed, and 2 queen size beds north and south of the trailer, under the sun shed. Meals are basic, often sun-oven cooked. Stores and eateries are 18 miles away. 3 Moons Project is located in a remote desert area (dirt roads) within the Death Valley system.